DENVER (Jan. 29, 2019) - Today marks the first on-road deployment of an autonomous vehicle (AV) shuttle in both Denver and the State of Colorado. The EasyMile 100 percent electric, autonomous shuttle made its debut this morning and will continue operating for the next four to six months. The self-driving shuttle will connect passengers from the 61st and Peña commuter rail station to the Panasonic and EasyMile offices and to the 61st and Peña Park-n-Ride lot via four stops. Regional Transportation District's (RTD) General Manager and CEO Dave Genova and Denver Mayor Michael B. Hancock joined representatives from, EasyMile, Panasonic, Transdev, and L.C. Fulenwider, Inc. for a ribbon cutting and ride aboard the unit. “We’re excited to see how driverless technology will work in Denver and to embrace new, innovative and better mobility options to move more people and improve travel for residents and visitors alike,” Mayor Hancock said. 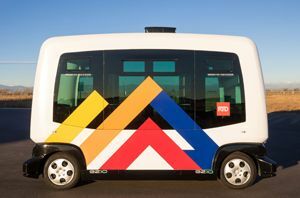 Transdev will operate the EasyMile autonomous shuttle for the RTD in a new route called 61AV, serving people who park and live near the 61st and Peña commuter rail station free of charge. The project’s main goal is to assess the viability of autonomous services in providing first and last mile connections to and from transit. The shuttle will run a predetermined route Monday through Friday from 10 a.m. to 6 p.m., making a complete loop every 15 minutes. Although it will not have a driver, an ambassador will be on the shuttle at all times to help answer questions and ensure safety for the passengers and operations. Transdev will also provide the ambassador for the RTD service. Partners in this AV demonstration project believe autonomous shuttle services will transform local communities and become an integral part of how communities are designed in the future. “Having an EasyMile autonomous shuttle circulating throughout the entire Peña Station NEXT and Peña Station NORTH developments will be a key element that will help change the overall complexion of real estate development…and it’s being tested now,” said Cal Fulenwider, III, CEO and Chairman, L.C. Fulenwider, Inc. The EasyMile shuttle will be programmed to make designated stops along predetermined routes (see map). It runs an average speed of 12-15 miles per hour and can carry up to 12 passengers. This autonomous vehicle demonstration project is approved by the National Highway Traffic Safety Administration and the newly-formed Colorado Autonomous Vehicle Task Force for six months of operations. Data collected on usage and operability will be shared between project partners to improve future deployments and bring autonomous services into wider usage. "We are pleased that our CityNOW stakeholder alignment process is resulting in yet another transformational industry 'first',” said Jarrett Wendt, Executive Vice President Panasonic Corporation of North America. “Together with the City and County of Denver, Denver International Airport, RTD, L.C. Fulenwider, and EasyMile we continue to produce groundbreaking advancements that none of us could accomplish on our own." EasyMile says its shuttle and operating system have been tested and verified over 200,000 miles in 22 counties, and have transported over 320,000 people with no accidents or injuries. The shuttles have air conditioning, automatic wheelchair ramps, passenger information systems, electric batteries, and onboard USB chargers. Passenger feedback on all of these deployments has been extremely positive. Transdev and EasyMile have partnered on over 50 deployments covering more than 10,000 passenger trips in the U.S. Globally, Transdev has provided over 2,000,000 fully autonomous passenger trips in the past 10 years, and works with several vehicle and software system providers to design and implement fully integrated autonomous mobility solutions. "EasyMile is proud to be deploying our EZ10 as an integrated part of the RTD transit system. Driverless technology is a key part of our future transit systems and we thank RTD for their leadership and vision," said Sharad Agarwal, Senior Vice President of EasyMile North America. More information about the Route 61AV project is at http://www.rtd-denver.com/61AV.shtml.